Most books (or sites) on photography or cinematography have chapters dedicated to understanding the focal length of a lens. There is a scientific definition for the focal length of a lens, of course, and none of the above are wrong. However, I found them utterly confusing. It took me a lot of time to ‘get’ what a focal length is really supposed to mean. I couldn’t afford to run out and buy all the lenses to test on my own, and I had no access to lenses (mobile phones and digital cameras weren’t available then). It was not until my first year in college that I finally began to ‘get it’, and I did it without the help of a lens and camera! This article is my overly simplistic understanding of the meaning of the focal length of a lens. If you’re having a tough time understanding what you’re reading, , like I had, try this. When drawn on paper, this is called a perspective drawing. This is our perspective, if you will. The above point is a vanishing point, because, seemingly, the world compresses and vanishes into this point! While drawing, we can have many vanishing points. In the real world, there is only one. The line where the ground meets the sky is the horizon. The vanishing point always lies on the horizon. This is how any lenses works, including our own. 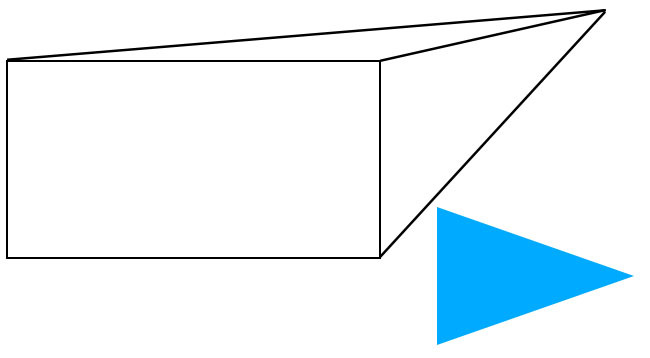 The blue triangle is the side view. You are always at the left end, the widest end. At the other end lies ‘infinity’, which never happens in reality but let’s not complicate matters. This ‘crushing together’ makes us feel as if the objects are closer to each other. Even with the crappy example shown above, you can feel the effect. The trees and park bench appear closer together. Go outside and form a loose fist so you can see through it. Focus on an area far away and you’ll see two objects closer than they really are. 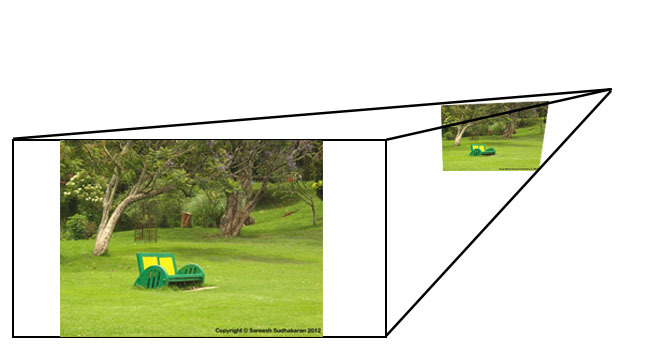 If the middle view is how it appears to us, and the smallest image shows how it would appear if the scene were further away, the largest image is what would happen if we walked closer to the scene. The same palm that looks normal at arm’s length can cover your eyes completely. When you go wider than what the eye can normally see, the objects look more stretched out and further away from each other. The eye can only see one way, and that is the ‘normal’ way. To see more or less of a scene, we normally have to walk (or drive or fly) backwards or forwards. We can get the same effect with camera lenses, while remaining in the same place. The normal point is how our eyes would see the scene. Camera lenses have the ability to go wider, i.e., bring more of the scene into the frame. They also have the ability to go further away and show lesser than what we can see. 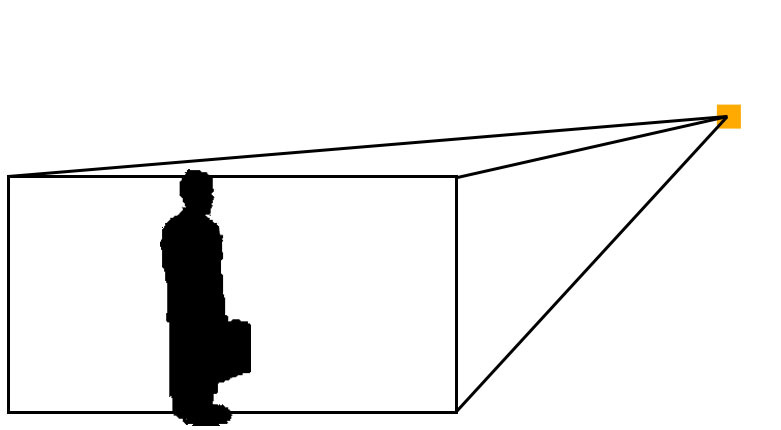 Therefore, if the scene is a prism box (more like a cone) that vanishes into a point, a camera focal length represents one slice of the box, and everything else after it, all the way to the vanishing point. 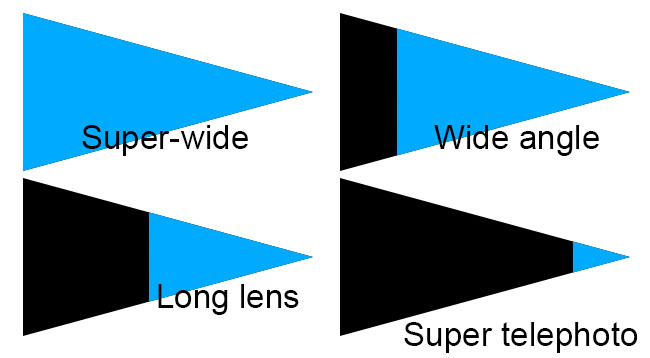 A wider angle will show a slice towards the left, while a telephoto lens shows a slice to the right. 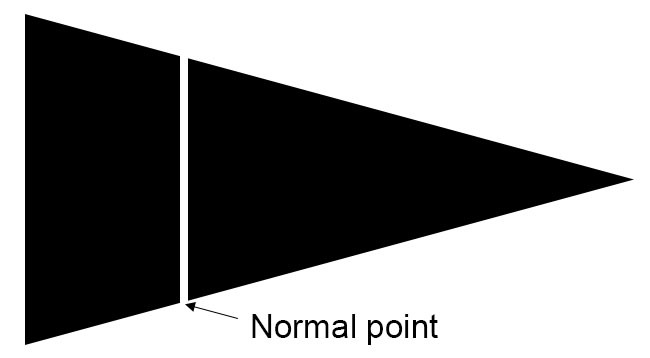 A focal length that shows something similar to what we see is called a normal lens. A super-wide angle lens sees the most. 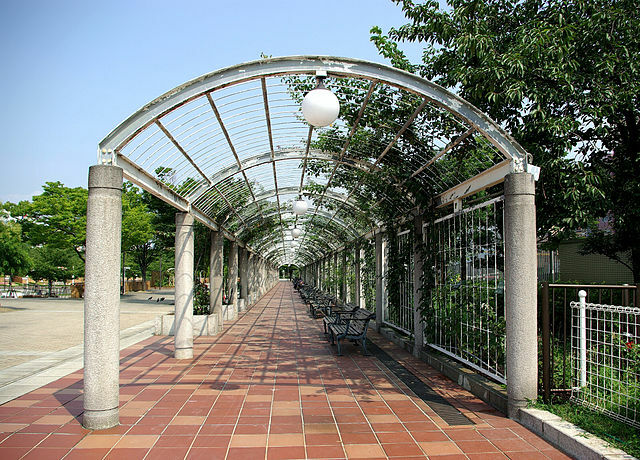 Such a lens can be rectilinear or fish-eye (the former is ‘normal’, while the latter is distorted). 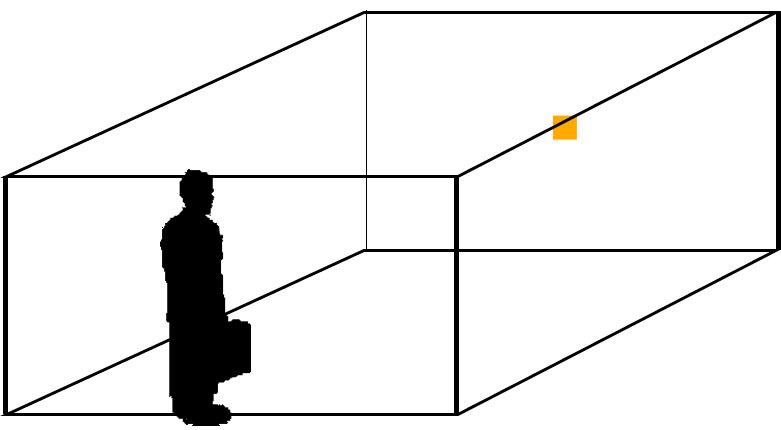 Objects at the wide end appear further away from each other than you would see with your eye. A wide angle lens will see wider than what you perceive to be a normal lens. Read Driving Miss Digital to know why this is. In reality, your eye can see close to 180 degrees, and it doesn’t get much wider than that! A long lens will show you less than what your eye can see. It’s as if you put a box or frame in the scene and you’re looking through that. The perspective remains the same, mind you. What you see in real life will be what is shown. A super telephoto goes much further away, sometimes farther than what you might be able to see! A telescope works like this. It will show you only a small cross section of the scene, as seen by yourself. Note, you will never reach infinity, because it doesn’t really exist. In Part Two we’ll put this basic understanding to practical use, and see how the focal length of a lens affects our storytelling ability.